Join the entire USS Applepies crew as they learn an important lesson in the power of sharing! 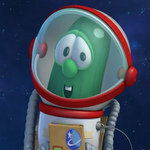 The new Veggies In Space: The Fennel Frontier DVD is scheduled to be released on March 11, 2014 and is now available for pre-order on Amazon.com. Check out the digital short below and stay tuned for more Veggie news! This entry was posted by Christy on February 25, 2014 at 9:00 pm, and is filed under Site News. Follow any responses to this post through RSS 2.0.You can leave a response or trackback from your own site.